With three (3) planned 510(k) submissions in the first quarter, 2018 is off to a great start. Innovative Health has already assembled an extensive portfolio of 510(k)s for existing reprocessable devices – so these new submissions will move the industry forward with additional reprocessing options – adding to the savings opportunity for EP Labs across the country. Innovative Health received ISO 13485:2016 certification for our quality management system. We received the certification based on a comprehensive audit by BSI, a global business standards firm with expertise in helping organizations comply with these standards. ISO 13485:2016 requires that organizations demonstrate the ability to provide medical devices and related services that consistently meet customer and applicable regulatory requirements. BSI's on-site visit of Innovative Health's Scottsdale-based facility focused on areas ranging from production processes and document control to product validation and shipping. The audit included a comprehensive evaluation of Innovative Health's processes including the production areas as well as various management reviews, an evaluation of customer feedback and in-depth meetings with its leadership team. Innovative Health also recently completed our first FDA inspection, with no 483 deficiencies documented as part of our Establishment Inspection Report (EIR). Many companies receive warning letters or recommendations for voluntary improvements, but in this case, the FDA reported no objectionable items based on its on-site inspection of our facility. As a medical device reprocessor, Innovative Health employs state-of-the-art technology to clean, test and sterilize costly devices used in some of the most advanced cardiac procedures. Our high standards of quality and safety in its reprocessed devices exceed those of the original "single use" products, as these are 100% inspected. 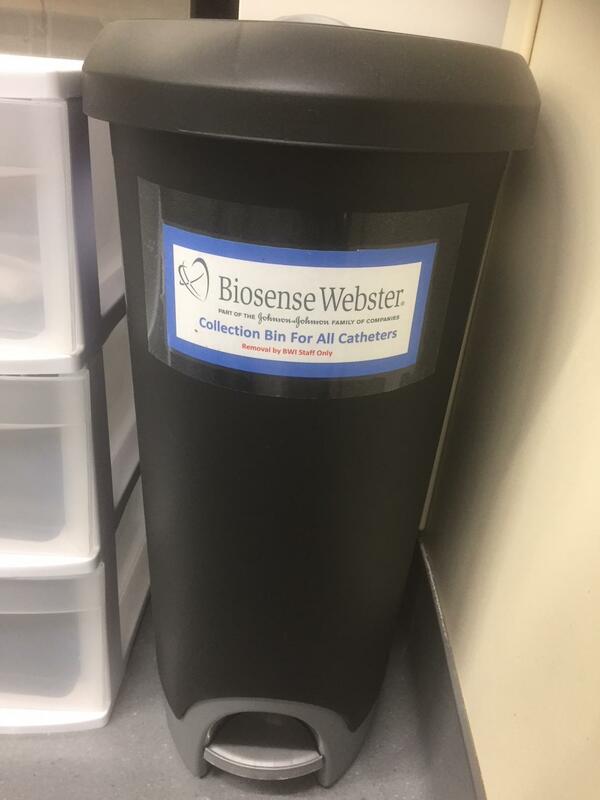 On several occasions, Biosense Webster reps have been placing collection bins in EP Labs marked “Collection Bin for All Catheters” (see photo below). In some cases, this bin is placed right next to Innovative Health’s collection systems. Hospitals that place catheters in the Biosense Webster bin will not benefit from reprocessing savings through Innovative Health. We recommend that Biosense Webster reps are reminded that devices, used or un-used are the property of the hospital and cannot simply be removed from the floors. The fact that the Biosense Webster collection bin is actually a garbage can may symbolize their view on devices that can be re-used. Innovative Health published the article Use of Catheter Reprocessing to Reduce Cath and EP Lab Costs, in the journal of Interventional and Diagnostic Cardiology: “As an industry, we must seek to balance these interests, adopting new technologies that truly advance treatment, while preserving quality and affordability of care as well as the autonomy of the hospital to make device utilization decisions”.